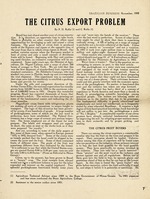 A typed draft and a published article, "The Citrus Export Problem," by P. H. Rolfs and Clarissa Rolfs, from Brazilian Business, November, 1933. A discussion on the problems of exporting fruit from Brazil and some solutions. tion. It is therefore, an opportune time to take stock. house and provide for crates. Under the able- a.nd competent direction of Dr.
me of 2,088,893 boxes in 1931. Despite this wonderful. purpose. The labels and wrappers used are superb. sometimes different from that indicated by the brand. growing is merely an "avocation" and not a vocation. million and eighty-eight thousand boxes for export. critical should read page 63 of "A Fruticultura no Brasil"
published by the Ministerio de Agricultura in 1932.
attempting to answer, in part, in this brief article. and equipped as the result of high tension emotion. year and the industry has taken one step forward. delusions as to the inertia that has to be overcome. export. Their enterprise should be lauded. Unfortu-. is. to buy the best fruit possible for the least- possible. be, and ships it before: it is palatable or nutritious. He. and has since conducted, the State Agriculture College.,. (2) Assistant to the senior author since 1921.
he is represented by the most astute lawyers purchasable. was not taken from Brazil, we affirm most positively. immediately following, the trees should be "fiscalized"
scale insects and rust-mites to the fruit should be made. a grove whose soil was ih first-class cultural condilbn'"
dition ihfat the trees could not produce export fruit. away. (See page 27, "Propagaqao de Citrus no Bras'l,"
- sufficiently spaced to produce delicious and sightly fruit. engineer and two hose men. and retention of rot germs during and after washing. Bright (See Hume "The Cultivation of Citrus Fruit,"
fruit was being wrapped while still moist at the calyx. and twisted stem hole would be inoculated with spores. of the fruit and secondarily by its taste and flavor. their part, little will be accomplished. have not been injured in picking and hauling. The. of shipments that have been sold for gbod prices. onals are out of employment. rate with the government fiscal agents. fair name of the country. attacking the problem from a 'different standpoint. 8) Standardization in its incipiency. those who have no investment in the industry proper. industry to curb their greed. these will learn oruy by the expensive "trial and failure"
from Brazil in competition with North American fruit. working ys and one obligatory day of rest (Art. I). men, purchasers an collectors when doing outside work. mittees and their powers is set forth in t Regulations. pany is not so handicapped. crates bearing it will be accepted at a premium. experts are the most costly. that there are more jets of water than fruits. Brasil has just closed another year of citrus exportation. taken immediately to establish a packinghoseantd provide. for crates. 8). Assistant of the senior author since 1921.
a nossa 6 vendida centre 3.00 e 6.50 florins. * -- < '"
eightyeight thousand boxes for export. Ministerio de Agricultura, in 1932.
ing to answer, in part, in this brief article. has taken one step forward. ing under no delusions as to the inertia that has to be overcome. sible money. They have practically no money invested in the industry. vocal d in the industry abd protest against any and all regulations. ~Lon of %quick and easy money'. the picture we have dram here is true to life but it was. vations made on that day and partially on previous knoweldge. his demonstration (verbal instructions are not sufficient). times the number of trees that could possibly produce export fruit. far as five meters away. (Bee page 27, *Propagagco de Citrus o.
out sunlight a leaf cannot function properly. The fibrous roots absorb the crude material from the soil. squeezing of the fruit in transit. secondarily by its taste and flavor. part, little will be accomplished. That is excellent I It should be generously seconded by the exporter. number of shipments that have been sold for good prices. nationals are out of employment. grove to standard varieties with the view of producing export crops. is to prepare the trees now for next years export. about the time te petals are being shed.) Second: Employ a coupe. and everybody ex 6tg the exporters, who were the real culprits. practically unlimited and as perfect as science can make itU 2). gle for the industry to curb their greed. are very different from Florida or California citrus growers). has been very great and commendable. The government is severely handicapped since 'emotions. least, the cheapest experts are the most costly.